The Stated Home was born out of a desire to fill the void we found among common retailers (a lot more on that below!). That’s why our approach to selling furniture is so different from what you’ll find at the other retailers. Our upholstery is made by Lee Industries, which does all manufacturing in Conover, North Carolina. Lee Industries is the only upholstery company to have been awarded Gold status from the Sustainable Furnishings Council, so you know we adhere to one of the highest levels of environmental responsibility. All of our sofas have the same high-quality construction, meaning you just need to focus on which style you like best. We also want you to be thrilled with your purchase, which is why we have a lifetime warranty on the frame and suspension and a seven-year warranty on the cushion. If you aren’t happy with your purchase, we also gladly take it back (see our return policy details here). Frames: Our frames are the highest quality possible, made of hardwood or engineered hardwood from certified sustainable forests. The joints are either double-doweled and corner reinforced or mortise and tenon construction. Suspension: Almost all of our furniture uses a true eight-way hand tied suspension–the absolute best you can buy. The only time we make an exception is when the functionality or design doesn’t work with that suspension (eight-way hand tied suspensions requires more space than other options). Our swivel gliders, for example, use a sinuous spring suspension in order to have room for the gliding mechanism. Our product descriptions note when sinuous spring is used. Cushions: Unlike many retailers, almost all of our styles are available with seat cushions in three options: a foam core wrapped in down, a foam core wrapped in fiber, or an inner-spring core wrapped in down. Back cushions can be filled with either fiber or down. If you’re allergic to down, we have hypo-allergenic options available too. You just have to contact us to place that order. Warranty: The frame and springs have a lifetime warranty. The warranty on the cushions covers manufacturing defects for seven years. Price: Our Nantucket sofa slipcovered in a cotton fabric measures 93”W x 41”D x 38”H and costs $3105 with free shipping. Conclusion: There’s no guessing on quality when you order a sofa through The Stated Home. And don’t be worried that we use engineered hardware in our frames—it can actually be stronger and more warp- and crack-resistant than hardwood. We also offer a lifetime warranty, so you have an extra layer of assurance that your piece will last. That’s us. Now take a look at the other options out there. We’re always concerned when it’s hard to find construction information on a retailer’s website–it makes us wonder what they’re hiding. Unfortunately, that’s the case with RH. The company charges a lot of money for its furniture, but provides the least amount of information online about it. We could find no diagrams, explanations, or sections on their site talking about how well their furniture is made. We also couldn’t find any information on their website about where the sofas are made, but we have seen “Made in China” printed on their pieces. And the only mention of environmental responsibility we found is that their catalogs are made on forest certified paper and are recyclable. Frames: Made from kiln-dried hardwood that is double-doweled and corner reinforced. Suspension: Most of their styles claim to have an eight-way hand tied suspension, but based on the fact that their furniture is imported as well as information on other websites, we suspect they may use drop-in units rather than genuine eight-way hand tied construction. They also use pocket spring suspension in some pieces, which is a lower quality than true eight-way hand tied. Cushions: They offer foam wrapped in fiber or down as well as 100 percent down cushions. There is no mention of what the foam is made from, meaning it’s likely made solely from a petroleum-based polyurethane. As for the 100 percent down cushions, we’d stay away from those. With no foam core to help hold their shape, they can flatten out very quickly and require a lot of fluffing. RH sells no cushions with an inner-spring core. Price: We looked at the Grand Scale Roll Arm Sofa, which measures 96”L x 43”D x 37”H, in a cotton slipcover. It is $2650 (if you have the $100 RH membership, it is $1987). Shipping ranges from $200 to $450 depending on where you live, for a total of $2187 to $2437 (plus the $100 for the membership fee). Conclusion: We would stay away from RH sofas based solely on the fact that they are imported. Their construction does not justify their high prices. Crate & Barrel does a slightly better job of publishing construction information, though it doesn’t clarify terms, provide images, or tout the quality of their furniture. It looks like they have three different sofa constructions in a range of qualities. Frames: All of the frames are either kiln-dried hardwood or kiln-dried engineered hardwood and all claim they are certified, meaning the wood comes from responsibly managed forests. There is no mention of the frame construction, but it’s probably safe to assume they are either double-doweled or mortise and tenon. Suspension: The distinguishing factor between the three sofa options sold at Crate & Barrel is found in the suspensions. From lowest quality to highest quality, they sell sofas with the Flexolator grid system, sinuous spring, and just a few styles with eight-way hand tied suspension. Cushions: All of the seat cushions are made with a soy-based foam wrapped in either feathers and down or fiber and down. The back cushions are all fiber on some styles and all down on others. There doesn’t appear to be an option to change the cushion fill if you prefer a firmer seat or want cushions with less maintenance. There are no cushions available with an inner-spring core. Warranty: Upholstery frames have a lifetime guarantee. We didn’t see any warranty information on the suspension or cushions. Price: We looked at the Harborside sofa, which measures 92”W x 38”D x 37”H, in a cotton slipcover. The sofa costs $1900 and delivery runs $100 to $300 for a total of $2000 to $2200. Conclusion: Unfortunately, it appears there are only three styles of sofas made with the highest quality suspension, and one is only available as a loveseat. Like other stores, Pottery Barn doesn’t make it easy to find their furniture construction information. If you are looking at a piece of furniture and click on “Dimensions & Care,” you’ll find a few bullet points. But not every piece of furniture has the same information, making comparisons difficult. They don’t clarify terms, provide images, or tout the quality of their furnishings. Frames: When you can find mention of the frames, they are kiln-dried hardwood. A few styles mention mortise & tenon joinery and corner blocked reinforcement, but it’s unclear if this level of construction is carried across all of their styles or just the ones that mention it. Suspension: There’s no eight-way hand tied suspensions found here. They use sinuous spring and something called “hand-tied coil springs.” The latter is likely a drop-in coil unit with some hand-tied strings attached in some unknown manner. Cushions: The seat cushions are made with a foam core wrapped in fiber or down. Some styles let you choose fiber or down, but others don’t give you the option. It isn’t clear what the back cushions are filled with, but they’re most likely polyfiber. There are no cushions available with an inner-spring core. Warranty: There is no obvious warranty information. Price: We looked at the PB Comfort sofa, which measures 93.5”W x 41”D x 37”H, in a cotton slipcover. This sofa costs $1700 and delivery costs $100, so the total price is $1800. If you choose a special order fabric, you will be charged a 10 percent shipping charge, for a total of $1970. Conclusion: You can find a lower priced sofa here, but if you want a high-quality, long-lasting piece of furniture, this probably isn’t the best place to buy it. Room & Board has long been considered a go-to for people who want to ensure they’re purchasing well-made furniture. Because of their reputation for quality, we found it especially disappointing once we got into the specifics of their construction. Frames: The frames for all of their sofas are engineered hardwood with reinforced mortise and tenon joinery and reinforced corners. Suspension: There are three different suspensions used for Room & Board furniture. Two are to be avoided (a grid “flexolator” option and a webbing option) and the other, sinuous spring, doesn’t rise to the level of eight-way hand tied. Cushions: Room & Board does have some styles with an inner-spring core and others with a foam core, but it’s not clear what filling is in the back cushions. Warranty: There was no obvious warranty information on their site. Price: We looked at the Metro slipcovered sofa, which measures 88”W x 38”D x 36”H, in a cotton slipcover. It costs $1400, delivery ranges from $90 to $130, so the grand total is $1490 to $1530. Conclusion: We’re disappointed with the overall quality of their upholstered furniture. If you need a lower cost option for a sofa, their sinuous spring suspension styles could be a good choice for you, but avoid their styles that have the flexolator or webbing suspensions. Whew! We covered a lot here, but we thought it was important to pull the fabric back on what stores are actually selling. 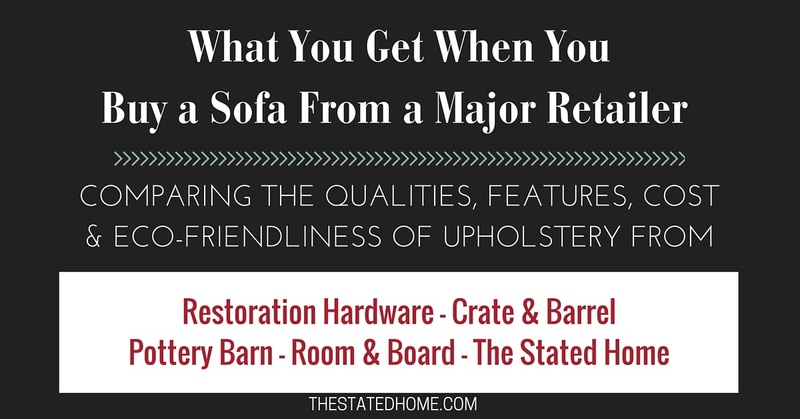 See it all in in this chart below—it compares similar slipcovered sofas from different retailers so you can see what your money can buy you. This compares just one model at each of the retailers—keep in mind that there may be pieces of better or worse quality depending upon the style you choose (also, the final price may vary depending upon fabric and cushions selected). Veneer Wood Furniture: Is It All Bad?